Dillon Beach in Marin County is a long, flat, gently sloping stretch of sand. It's seldom crowded except during the weekends or on holidays. The views are excellent, looking west past the end of the Point Reyes peninsula and straight out to sea. The only downside if you live in the San Francisco Bay area is that it's the northernmost beach in Marin County, making it a long drive to get there. The appeal of Dillon Beach is in its simplicity and a chance to slow down and enjoy nature. If you feel like you must do something, you can take a walk on the sand, go surfing or fly a kite. You can also go clam digging, but you'll need a valid California Saltwater fishing license. You can get a helpful summary of how to go clamming on the Lawson's Landing website. You'll also find a store and restaurant nearby, in case you get hungry. People often report seeing jellyfish, sea lions and pods of dolphins close to the shore. Many of them also say how lovely the tidepools are at low tide. Add the beautiful surroundings to that and Dillon Beach is a fun place to enjoy taking photographs. And while you're taking those selfies and Instagram shots, check out the pirate statue above the beach just below the store. You can get more ideas about what to do at Dillion Beach and see what other people think about it when you read Dillon Beach reviews on Yelp. Dillon Beach is a privately owned beach that charges a daily fee. You can get an annual pass. They have restrooms and picnic tables with fire pits. However, they don't have showers. If you (or your companions) are likely to get sand all over everything, be prepared. Take a change of clothing and a plastic garbage bag to put the sandy stuff in. It will help keep your car from looking like there was a sandstorm inside. It can sometimes be intolerably windy at Dillon Beach. A quick check of the local weather forecast can help you avoid feeling like you were sandblasted after walking for just a few minutes. A lot of people let their dogs run off-leash on the beach. That's fun if it's your dog frolicking around, but some non-dog-owning visitors say they can be a nuisance. Water quality is generally good at Dillon Beach, but in case you're concerned, you can check the latest water quality warnings at the Marin County website. Look for the data for Lawson's Landing which is nearby. Dillon Beach is a favorite spot for many local surfers. If you want to go surfing while you're there, check the surf report at Surfline. If you plan to explore tide pools or go clamming, it will also be helpful to know when low tide will happen. You can find tide tables at the WeatherForYou website. You can't camp on Dillon Beach, but that doesn't mean you can't stay overnight. In fact, the real pleasure of visiting it is to stay in one of the vacation rental cottages nearby. You can also find vacation rentals in the Dillon Beach area through Airbnb, or you can rent a cabin at the Dillon Beach Resort (two night minimum on weekends). Lawson's Landing, which is just south of Dillon Beach offers campsites for tents and RVs, just across the dunes from the ocean. For more information, check out their website. Dillon isn't the only beach in Marin County. 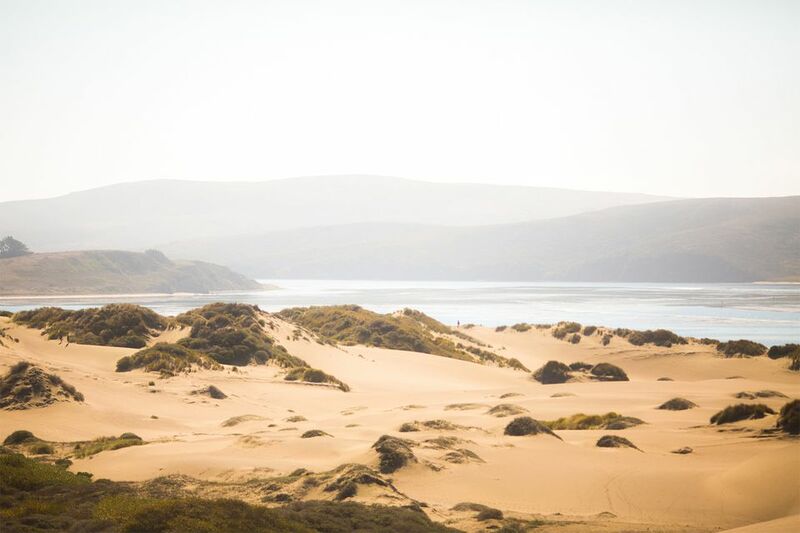 To find one that's just right for you, check out a guide to Marin County's best beaches. You can also find some clothing optional beaches in Marin County. Dillon Beach is west of U.S. Highway 1, at the north end of Tomales Bay. For GPS use 52 Beach Road, Dillon Beach CA. There is a parking fee at this private beach. On your way out to Dillon Beach, you may start thinking that you got on the wrong road. Don't give up - just know that you'll be driving through some pretty remote areas before you end up at the beach.